Village Green is a lovely facility in Federal Way where seniors can enjoy an independent lifestyle while feeling safe and secure. This facility offers all the comforts of home. The apartments are spacious and come with a washer and dryer. My resident I visit apartment is very nice and perfect size for one person. There are activities to keep residents busy; one of my favorites when I visit is the woodworking shop. It is very popular among the residents. The computer room has all the update to date equipment and when I am there I always see it being used. There is a pool they were doing water aerobics when I was there last the atmosphere is so inviting and relaxing, the movie room is a great room and nicely furnished, the library was incredible, I saw some reading, but the ladies were knitting. They have an amazing juice bar and the dining area was cozy.They have tailored their fitness program to meet the needs of each resident from water exercise, massage therapy; chair exercise for those with limited movement to walking activities to name just a few Staff provides blood pressure checks and monitors abilities and limitations for each resident, how beneficial and awesome. My resident can’t get out much and she loves she can partake in Bible study groups, chapel services, and transportation to local churches for those who wish to worship at their churches. What an excellent support for seniors and something you don't see too often. The staff is caring and supportive, my resident fell and they took the upmost care of her and kept me posted if she needed anything. They have a full calendar of events and activities both on-site and outings for residents the calendar is repetitive but still a good selection of things to do. A downside is they only provide dinner to residents; it would be nice if they offered three meals a day. Overall this is a good facility clean and plenty for residents to do. The staff is attentive and caring. The outdoor areas are nice for residents and plenty of areas for them to walk their dogs and enjoy the outdoors. It would be nice if they offered more than just dinner. The best way to get to know a community is by scheduling a tour. See the facilities, meet the staff and residents, and get a feel first hand what it's like to live at Village Green Retirement Campus Assisted Living. Created by the love of a family, Village Green Retirement Campus is built upon four generations of family members working together to create, maintain and manage the finest retirement residences in the Northwest. Surrounded by the beauty of perennial gardens, walking paths and majestic woods, we are the ideal location for seniors looking for both active and relaxing lifestyles. Between the verdant surroundings and the exciting daily activities Village Green has to offer, socializing with friends and being a part of an energetic community is why our residents know Village Green is the Natural Choice for Senior Living. This is the time of life when you've earned the time to stop and smell the flowers whenever you want. You can do just that in our lush gardens. Or if this is the time of your life where you would rather be doing something new, exciting and different every day, then Village Green is the obvious choice. Our activities schedule, entertainment opportunities, and local neighborhood attractions make us the natural choice for senior living. Accommodations are offered in retirement cottages and a variety of apartments sizes, both in a selection of spacious floor plans. Many accommodations feature full kitchens, fireplaces, air conditioning, gas heat and private patios or balconies. Activities of all sorts are held regularly, and may include trips to local restaurants, educational classes and exercise programs. 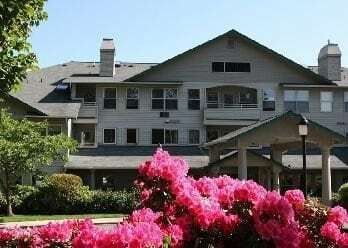 No matter where you live on our campus, each residence is provided with routine maintenance both inside and out. Scheduled transportation to run errands or reach appointments is available, and beauty salon and barber shop services are provided on site for convenience. Our assisted living residents have the peace of mind and assurance that assistive services are available 24 hours a day. We create a customized service plan for each individual to meet their personal preferences and needs, so residents only pay for the services they desire. At Village Green, residents enjoy a safe and worry-free senior lifestyle in a month-to-month rental community where you can choose from independent and assisted living options.